The Ledge Village is series of 3D buildings and accessories that can be combined in a mix and match fashion to build tiny villages on small ledges around your home. The buildings are thin, with all detail on the front so they fit on small trim ledges. Each file comes with a building and some accessories to build the village. This tutorial is for the church. Although the building construction is very similar to the other buildings in the village, the addition of the steeple adds some complexity requiring additional construction information. assembly for the church starts at the top, not the bottom. Here is a view of the church along with a few of the other village buildings arranged on a shelf. Below you can see an arrangement including the two-story house, cottage and Greek Revival house cutting files. This display is on a unique ledge in my laundry room which inspired me to create the line of drying clothes. You can see many additional photos of this space here. 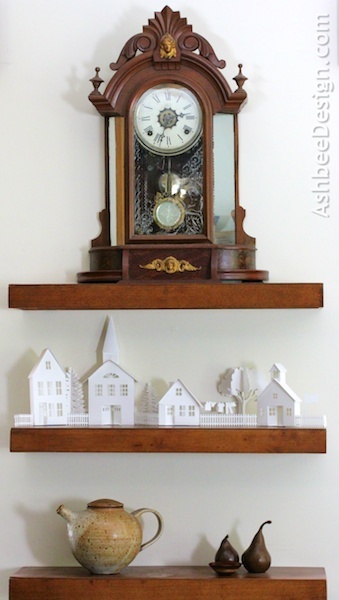 Consider installing a grouping on a window ledge. The outside light shines through and makes the windows "light up". 3D Ledge Village School House (Includes picket fence and flag). 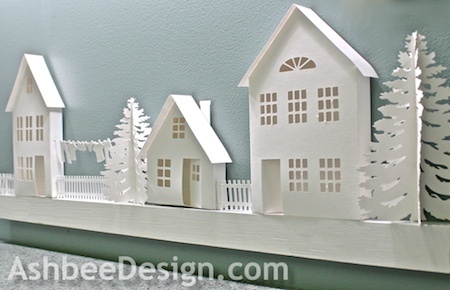 3D Cottage (includes maple tree, laundry and picket fence). The downloaded Silhouette file for the church looks like this. The other buildings are similar with the main building piece, the roof piece and some various landscaping accessories. The church is different because of the steeple and its cap. The picket fences are optional. If you don't need them, then remove them from the file because it does take a while for them to cut. 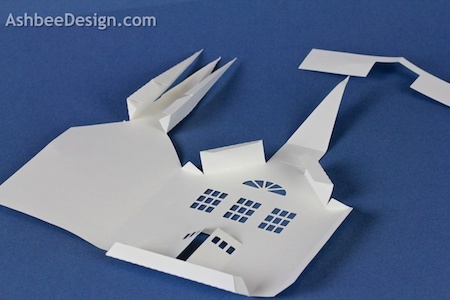 The settings will depend on the paper you use. 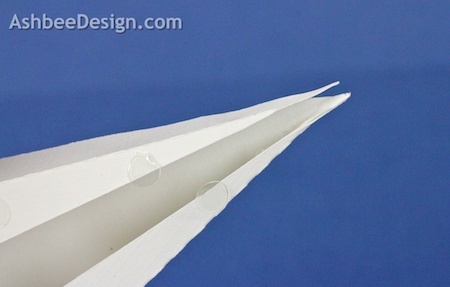 I have been using white card stock and cutting at a speed of 3, a depth of 33 and the blade set to 4. Fold all the dotted lines inward. 5. Glue the steeple together first. Generally, I start construction of Ledge Village buildings at the base to get that square. On this design it is easier to start at the steeple and work down. Using glue dots, glue the back of the steeple to the 2 sides. Try to get the tips to be as close together as possible but don't worry about them sticking together. They will be covered by a steeple cap. Put glue dots on all the remaining tabs of the steeple including the two tabs for the peak, the two side tabs on the square part of the steeple, and the two tiny triangle tabs that will hold the steeple to the roof. I have put arrows pointing to all the glue dot locations. Place the front of the steeple in place, working carefully to align edges. Use a long skinny tool (here I am using my scissor point) to reach up into the steeple and press all these seams together. It is important to line up edges and corners. I added a glue dot right at the peak to help hold it together. It is ok that is shows now. Look inside the church and up to the steeple. 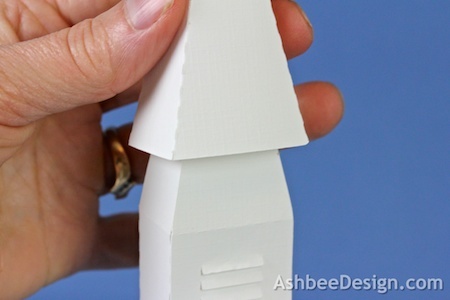 The two little triangle tabs that connect the steeple to the roof need to be positioned and pressed into place while you still have access to them. Note the red arrow below indicating location. 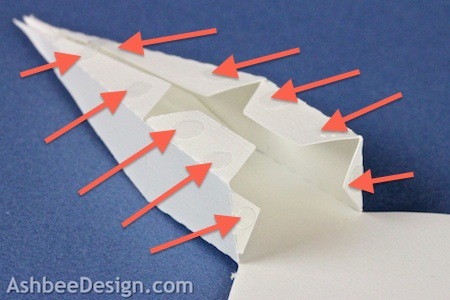 Add glue dots to the two side roof edges and glue in place matching up edges and corners. 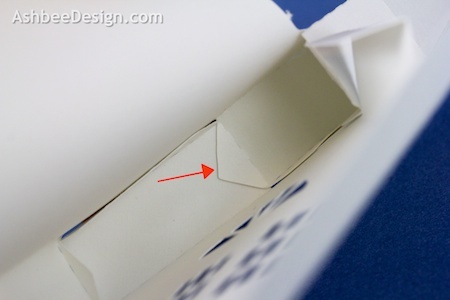 Do the same with the two side wall seams. Add glue dots to all 3 edges of the base and slide that into position. You can press these from the inside by reaching in through the double doors. The notch on the roof piece fits around the steeple. 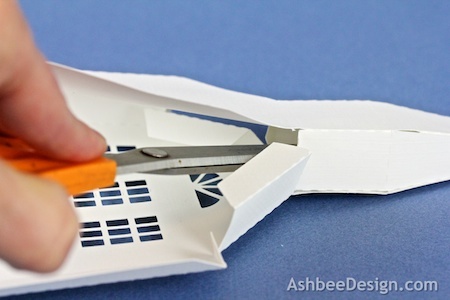 Fold it in half and use glue dots to attach it. 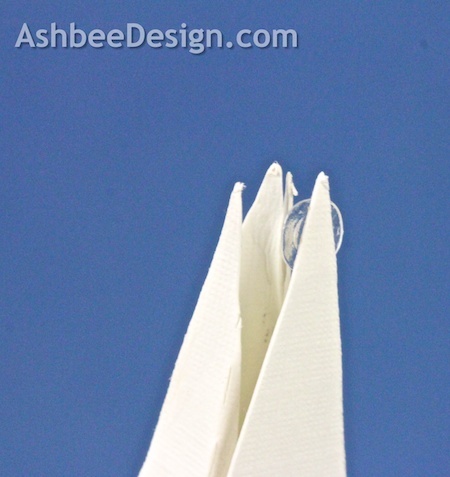 The steeple roof is a cap that gets put together and then slid over the top. Fold the steeple cap piece. 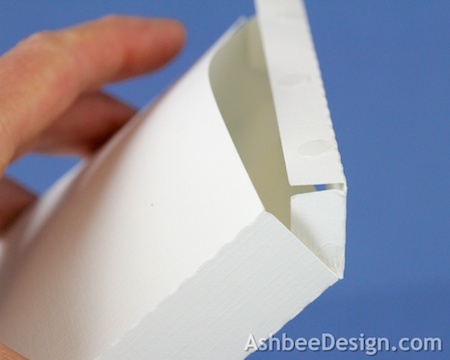 Glue the two end tabs together so the bottom forms a rectangle that matches the steeple shape. 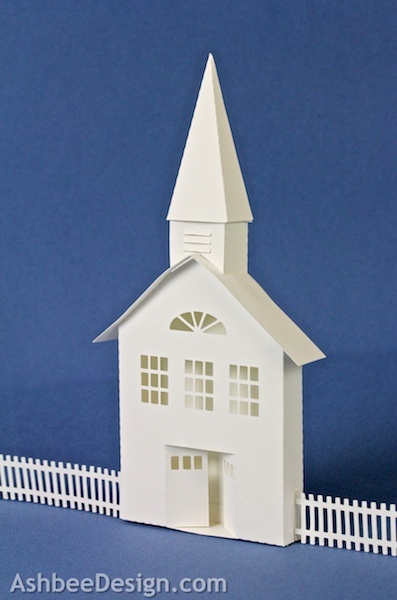 Put some glue dots on the base of the steeple roof and slide the cap down over them into place. 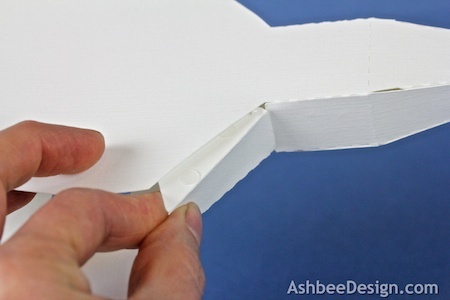 Also, take a flat tool (nail file works) and bend the vents for the bell tower out slightly. 7. Place on a ledge with other buildings from Ledge Village. 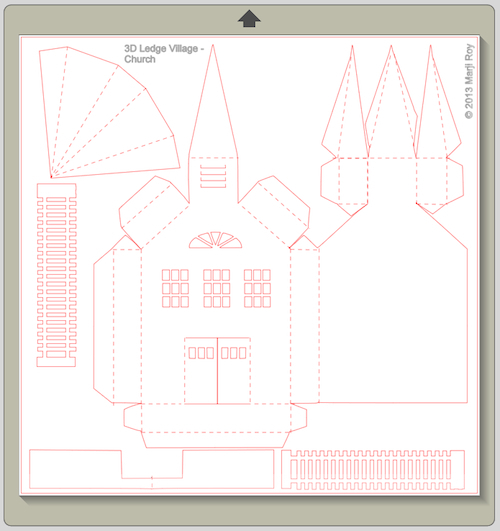 This design is very cute but unfortunately it's too large to fit into a Silhouette Portrait and I had to fiddle around a bit till I was able to cut the church into two pieces. Enny, You are correct. The church does not fit on a 8 1/2 x 11 sheet of paper. It wasn't until after I designed the church that the request came in from Portrait owners. Since that one I have tried to split things up so they will work on both Portrait and Cameo. It often requires more pieces in the design but it can be done. Still learning here. I'm still learning how to do things with the Silhouette software too so no worries. Which software do you use for drawing your designs? I'm using Illustrator for designing my files and then import the dxf files for cutting them out. I made five of the little ledge houses today and they look very cute so I'm probably gonna buy the rest of them tomorrow. 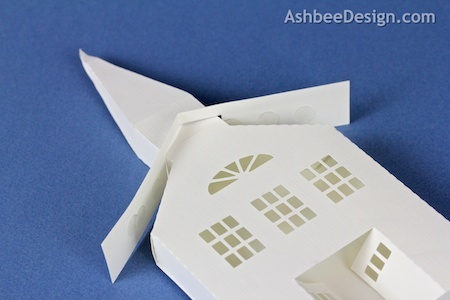 Btw, here are some similar houses I made last year when I got my Silhouette Portrait. I have started doing my building designs right in Silhouette. Originally I was designing in iDraw and tracing but I didn't like how that created tons of extra points. I expect other types of designs I might use other software. I have fought using Illustrator for years. It isn't a natural fit for me but I think I am going to have to bite the bullet and learn. You village is wonderful! I love the details- the rose window and the kitty in the window. Thanks for sharing. Marji, I absolutely love your whole village! It is so adorable! Is there any way to make the buildings bigger when I cut them with the Silhouette? Yes, You can vary the size of everything in Silhouette (both larger and smaller). Make sure all the parts of a particular building are in the same file and grouped together (Object Menu to GROUP) so they are one object. Go to the SCALE tool bar on upper right (click on icon of three little diagonal square.) Put a check mark in Lock Aspect Ratio. Grab one of the corners of the group and stretch. All parts will stretch together and in the same proportions so they should fit together. 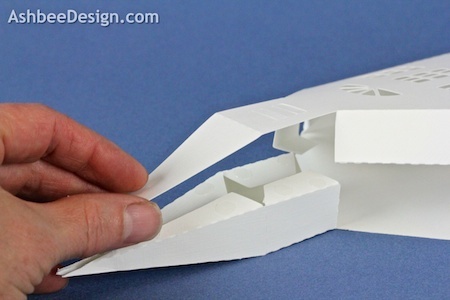 You just need to be sure that each piece still fits on a paper size you can use in your machine. On a Mac you can just hold the shift key down as you stretch a group and that will hold the aspect ratio as well. Your village is wonderful ! if we don't have silhouette, is it possible to have the template to cut it manuelly? The files are available at 3dcuts.com. Here is the link. http://3dcuts.com/tea-light-village. Every download comes with the files in svg, dxf, and pdf format. 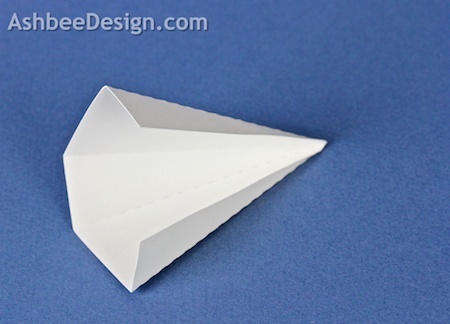 If you have software that can open a pdf file- you open that, print on card stock and cut with an exacto knife by hand. 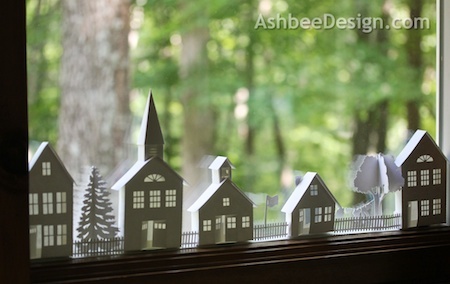 The windows on Tea Light Village are very tiny so you need great patience and skill to cut by hand. Other of my files like the birch shadow boxes are easy to cut by hand.